So, as many of you know, I was the co-Founder of the eGullet Society for Culinary Arts & Letters. In the last 10 years, the phenomenon of Sous Vide, or thermostatically controlled water bath cooking, has caught on like wildfire, much of it due to the popularity of a massive set of discussions on eGullet about it. Despite this massive amount of discussion about Sous Vide, I had no interest in the subject for the longest time. In fact, I felt it was so geeky and so elitist and pretentious that the only way I was really interested in enjoying food cooked using this method was in fine restaurants, which could afford the expensive thermostatically controlled water circulators ($1000+) and had the need to utilize it for large-scale cooking efforts, for which the technique and the technology was originally designed. But as with any technology, price does come down. And in the 10 years since the original eGullet threads started, microprocessor-controlled Sous Vide cooking systems have dropped down in price dramatically. How cheap? How about $99 for the Dorkfood Sous Vide controller now sold on Amazon, combined with a cheap hot plate/cheap rice cooker or an electric crockpot and a package of Zip-Lok bags? I was sent the Dorkfood controller to review by the manufacturer — I’ll have a more technical write up on ZDNet about it shortly. But let’s get to the meat of the matter: Anyone with the willingness to do so can now cook Sous Vide, with minimal skill, budget and debugging required. First of all, why would you want to Sous Vide anything? 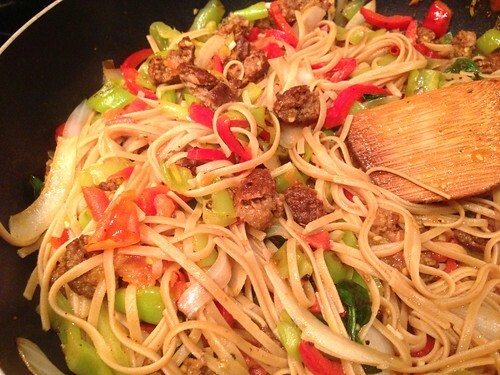 Well, the advantage is that you can cook a vegetable or a protein to its finished cooking temperature. 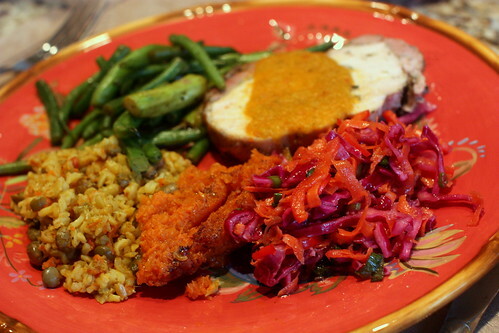 Once it reaches that temperature, it is perfectly cooked. Because you are cooking it in a sealed bag in a water bath controlled by a computer, you have no loss of juices and the meat does not dry out. 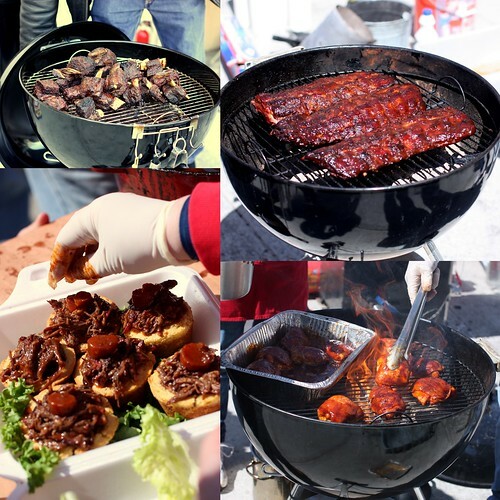 The flavors using this process are absolutely intensified because you are cooking the meat in its own juices. 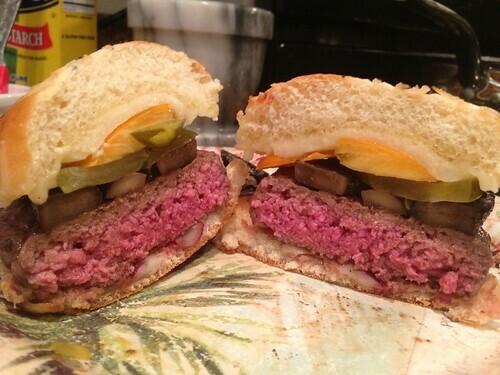 While Sous Vide is often used for extremely expensive cuts of beef, fish, seafood and poultry to cook right “on point” like the guys on Top Chef do, you can also use it to make the juiciest rare cheeseburger known to man. And if that isn’t worth forgiving me for using a fancy French technique on the 4th of July to cook an All-American Cheeseburger, I don’t know what is. You want to make one of these? Follow my lead, young Sous Vide padawans. Click on the “Read the rest of this entry” link below for more. Here’s another classic resurrected for the Chosen People… Foodies. Enjoy. 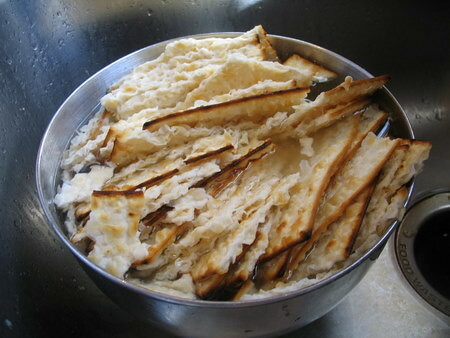 Matzo Brei — some people like to eat it just during Passover, but I like it all year round. To me, it’s the ultimate breakfast food. Both savory and sweet, it combines both aspects of French Toast and scrambled eggs in one package. The version we are going to do is a savory version which we’ll top with syrup. You can also do a strictly sweet version, but I think the whole notion of that is insipid — you really want the contrast of the savory and sweet together. 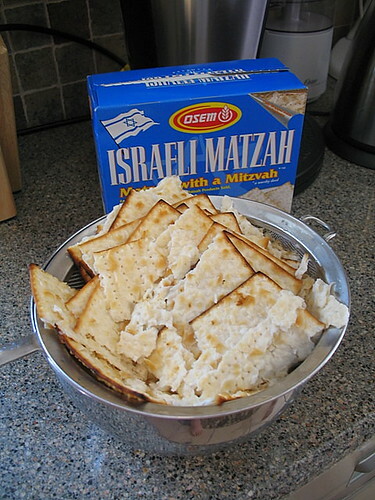 The first thing you’ll need to do is take half a box of plain matzos (which you can buy year round), crack them in half, and then half again, and soak them in a bowl of hot water for a few minutes. Then you want to drain them in a colander so they are just soaked and a little soggy, but not swimming in water. 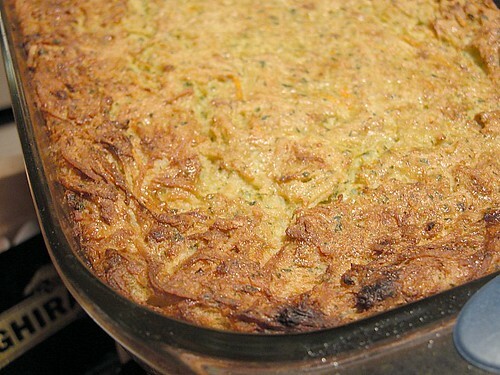 Are you ready to make the greatest Hebrew contribution to breakfast and brunch cuisine? Click on the “Read the rest of this entry” link for more. 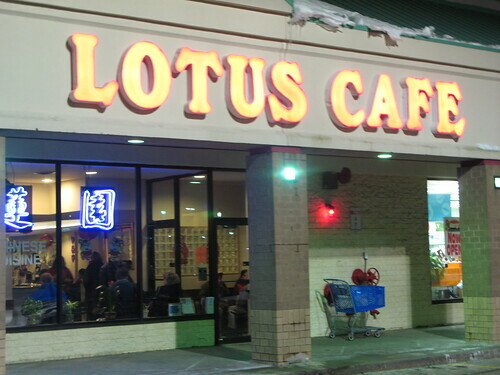 At first glance, you might dismiss Lotus Cafe offhand as your average suburban American Chinese joint in a strip mall, because that’s entirely what it looks like. For the first couple of years I lived in this area, that’s exactly what I did, and now I regret that mistake. While I wouldn’t say it has the depth that Petite Soochow or Chengdu 1 have with their Shanghainese/Sichuan cuisine, Lotus Cafe is putting out some seriously good select Taiwanese-style dishes on its menu, particularly all the noodle stuff they do.